In 2011, during I-70 construction MoDOT re-striped the Hwy 370 Discovery Bridge between St Charles and St Louis Counties to remove the wide shoulder that included bicycle and pedestrian access. The bridge was closed to bicycling, creating long detours for cyclists who previously used the Discovery Bridge to cross the Missouri River. At the time, MoDOT promised to return the Discovery Bridge to its original configuration in 2014 after I-70 construction was complete. Several of our members have recently enquired if we know the status on the plans to re-open the bridge for bicycling. Today Tom Evers of MoDOT's St. Louis District contacted MoBikeFed to confirm that the Discovery Bridge re-striping project will begin work the week of May 19th, 2014, and MoDOT plans to complete the work within a month. So by mid June 2014 the Discovery Bridge will be open to bicycle traffic again. In related news, area municipalities have applied for funds for a major bicycle, pedestrian, and trails connectivity project in this region. 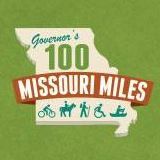 It would include improved bicycle/pedestrian connectivity across the Hwy 370 Bridge, a separated bike/ped path on the I-70 Blanchette Bridge, and a network of paths and trails along the river to connect the new river crossings with existing trails and river crossings and with each other.